Presentations will be in English. 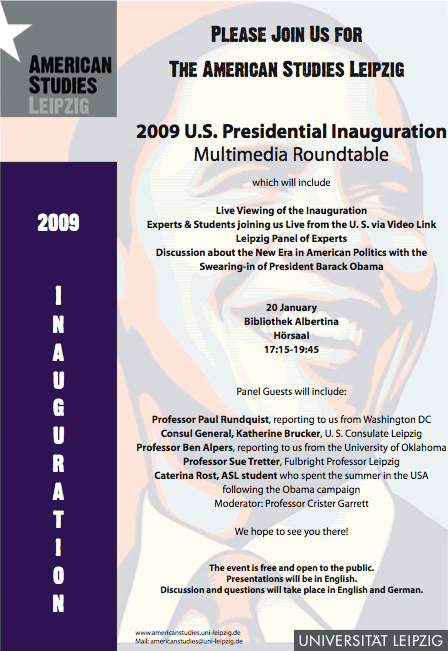 Discussion and questions will take place in English and German. Submitted by Christiane Maaß on Wed, 01/21/2009 - 01:07. It's really sad that a lot of the current ASL students (including me) couldn't take part because the room was to small! Submitted by Dr. Sebastian M. Herrmann on Wed, 01/21/2009 - 21:39. Yes. Absolutely. This is the one regret we have about an otherwise very successful and exciting event. We wish we had been able to accommodate everyone, or at least gauge attendance more precisely ahead of time. When about twice as many people showed up as usually do (for a large ASL event), we ran into problems with the room's maximum occupancy (both in terms of the fire code and in terms of what the room can carry, literally). When debriefing after the event, we discussed requiring people to sign up for all events in the future... We’d be interested to hear your thoughts on this. In either case, we do apologize to everybody we had to turn away. Submitted by Christiane Maaß on Thu, 01/22/2009 - 00:48. Yeah, we also discussed that if people are required to sign up for events like this, such a "mess" probably wouldn't happen a second time. I think it's an idea you can work on.